Summary: Construction inspections are made to insure that new home construction is in compliance with Building Codes. Building codes are a set of minimum home building standards. Hi Rose, Actually, the rest of the important ones are mentioned, just hard to find in the minutia of text. 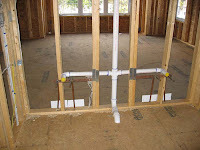 STEP 11: Rough-ins (1-2 weeks) All electrical, plumbing, heating and air-conditioning, phone pre-wires, cable or satellite TV lines, stereo and intercom, Internet, and burglar alarm systems should be roughed-in at this time or anytime after step 8 is completed. This does not mean that these units are installed at this time - only the wiring or plumbing for them. Inspections are needed when this step is complete. 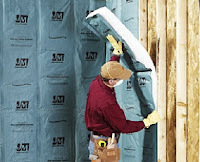 STEP 12: Insulation (3 days) Consult with your local utility company on the insulation you need to qualify for their lowest rates. Some locales require an inspection of insulation by both the utility and the building inspection department when it is completed, and before it is covered with drywall, paneling or plaster. My list of inspections does not mean it will be your list of inspections. You may have more inspections or you may have less depending on the locale in which you build your new home. It varies widely. Having more inspections is good, especially for the 1st time home builder as it takes some of the worry off your shoulders. It is also a great selling tool when you go to sell the house. When you go through the process of obtaining all your permits you will find out what inspections need to be done for your house. In most locales the cost of permits covers the cost of required inspections. NOTE: All work requiring an inspection must be inspected prior to covering. Well Rose, I am glad you brought the subject up as it’s important. I should have thought to write this a long time ago. Thanks. You are probably surprised that there are so many inspections. Copyright © Carl Heldmann. None of this site may be reproduced without written permission.